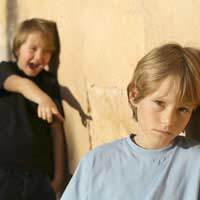 Bullying can take many forms and occurs not just in schools but also in other situations in which a group of children participate. This can be among peers playing in a local park, at cubs, scouts or brownies, at school or while away on a trip organised. When a child is bullied it can be very traumatic, not only for them but also for their parents. It can be difficult to know what to do and is frustrating if you do not feel the school is taking it seriously. So where does the law stand on bullying? It is a legal requirement for all state schools in the UK to have a Bullying Policy. However, schools adopt a variety of different approaches for dealing with bullying behaviour, and to date there has not been significant research to gauge which of these methods is the most effective in dealing with the problem. Peer Support – Certain older individuals are nominated as being contact points for children who are being bullied, and undergo significant amounts of training in order to ensure that they are capable of dealing with bullying situations. This can be a very beneficial system in that it allows isolated children to approach older pupils for support. The No-blame Approach – This begins with interviewing the victim and asking them to express the effect of the bullying on them. They may not have to talk about it, but may be asked to draw a picture or write down how they feel. The teacher and a group of students, including the bully and the victim then hold a meeting. The teacher explains the situation and invites the children to come up with a solution. Unfortunately, this is often seen by parents as a ‘soft option.’ In primary schools, ‘circle time’ is used to discuss bullying. Another similar method is ‘restorative justice’, in which rather than being blamed for their actions, the bullies are asked to recognise the harm they have caused and make amends. Counselling – Both the bully and the victim are brought together to discuss the issue, supervised by a mediator. Unfortunately, this often has the effect of giving the bully more ammunition for later on. ‘Telling’ – This is where schools place a responsibility on bystanders to tell teachers that someone is being bullied, and has the effect of giving the school a ‘no tolerance’ approach. It has been proven to work well in conjunction with the peer group method. Sanctions – If a child is persistently bullying one or more of his or her peers, usually the school will call the parents in for a meeting to discuss their child’s unacceptable behaviour. As well as the above methods for dealing with the issues, schools can and do use sanctions against the behaviour, such as detentions, warnings, temporary exclusion and internal exclusion from other children and in the most serious cases, expulsion. Assault can constitute punching, kicking, slapping, or even spitting at someone. Harassment is a course of conduct (i.e. once is not enough to constitute harassment) which could include calling someone names, making abusive phone calls, sending abusive emails or text messages, issuing threats or putting derogatory or abusive messages on the Internet. Threatening to kill someone is a criminal offence, although in practice it is usually only adults who are prosecuted for this. The Public Order Act 1986 applies to public places so is not for use in schools or on other private property, e.g. within a home environment. However, it would apply for example to a park, road, shopping centre or other public place. Under section 5 of this Act, it is an offence to use threatening, abusive or insulting behaviour in a way likely to cause harassment, alarm or distress. Under section 4 of this offence (which is more serious than section 5), if someone intending to cause harassment, alarm or distress uses insulting words or behaviour or acts in a disorderly way, or displays any writing or other visible representation that is threatening, abusive or insulting, they are guilty of an offence. It is important to remember that a number of these types of offences can also constitute a course of conduct that could amount to the making of an Anti-Social Behaviour Order (ASBO). 16 Years ago my ex partner assaulted my 2 boys (not his children) i was pregnant with his daughter at the time,,I had to go through Social services to prove i`m a good mam & this was proven...He never attended any meeting & refused his name on a certificate... Now he wants Parental Responsibility over her and wont allow her to come home...I Have a son also with him who requires a great deal of help due to having BSED But he has never bothered to help him ,,only assault him..... My Doctor has said not to sign papers he downloaded to get access,,he isn`t supposed to have my children according to my Doctor....What can i do?